The HP Color LaserJet 4700dn series is a large, speedy color printer, perfect for workgroups. This printer is intended for medium to high volume color printing. Our refurbished 4700dn includes a duplexer for two-sided printing, plus a built-in Ethernet port for connecting the printer to a network. This printer comes with a 500-sheet paper cassette and a 100-sheet manual feed tray. Compared to HP's latest line of smaller color LaserJets, a refurbished 4700dn can save you a bundle in printing costs! Also, compare our toner cost with HP's pricing -- you'll be surprised at the savings! Toner cartridges for this model are large capacity, 10,000 page yield at 5% coverage. Smaller color LaserJets only print 2,000-4,000 pages per cartridge, resulting in a higher cost per page. 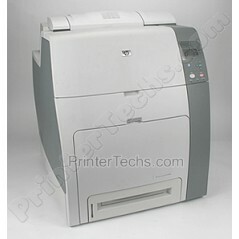 LaserJet 4700 remanufactured toners are readily available and reasonably priced. Toner cartridges for new printers tend to be ridiculously expensive. See below for a cost analysis. 20.5" x 23.5" x 24.7"